Reusable, custom printed 16 ounce plastic stadium Christmas cups are very versatile and are the ideal size for cocktails, beer, punch, soft drinks, and more. Our most popular cup size, these custom cups are personalized with a holiday party design and up to three lines of text. Afterwards, your guests can take home their reusable cup as a souvenir of your holiday party. Love the cups, and my guests did too! They were a fun addition to girls' Christmas party. Exactly what we wanted! Thanks! Item is high quality and turn around time was amazing! I highly recommend this product to" light up" any party you're having! I absolutely love the personalized cups we ordered for our Christmas party. They had my order ready in a few days and shipped very quickly to get here in time for the party. They turned out even better than the pictures. I would definitely use them again. I ordered some custom cups for a Christmas party and I will definitely order from Tippy Toad again! They came out great and ordering times were accurate to estimates given. These cups were exactly like the photo and were a huge hit at our Christmas party! I would definitely order from TippyToad again! We ordered these last year for our ugly sweater party and everyone loved them! This year we ordered them again with a new design for our party. We can't wait to use them! Nice quality cups and fun designs. They were just as advertised and perfect. Love them. I order a custom logo in white on red cups. It turned out great! I have already put them thru the dishwasher and they still look like new. Its such a plus that they are reusable. Love them, looking forward to using them at the wedding shower. Received them, turned out beautifully. Great product, better than expected and arrived on time! Will use TT again and again for events and personal use. I ordered these cups for our annual holiday party, I had to rush them but they arrived in amazing time and the quality was perfect. The gold color for the font looked like gold foil and the cups turned out just wonderful. Our guests commented on how great they were all night and then were thrilled to take them home as their favor at the end of the night! I highly suggest these cups for any type of event! Everyone loved our cups at our Christmas party!! Nice quality, would definitely recommend to someone considering. These cups were awesome! I ordered the same colors from the sample picture and they came out exactly as expected. We ordered them for our Christmas party and everyone loved them! Such a cute addition to our NYE party! Arrived on time just as quoted! My cups arrived on time and exceeded my expectations!!! Having personalized cups took my party to another level. Allison was more than helpful when correcting a mistake I made when placing my order. She is awesome!!! Thanks again for making my "It's Going to Get Ugly at Roslyn's Christmas Bash" great! Great cups, fun party favor. We got many compliments on the cups and they all are printed well and were a hit!! Will be ordering again if needed and will recommend to all! Really nice and personalized. Good size. Everyone liked them and got here fast. 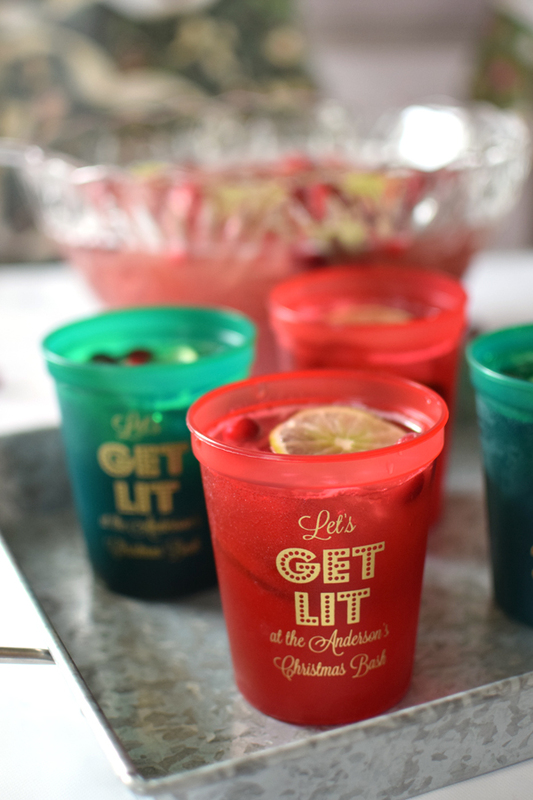 I ordered the red transparent red cups with let's get lit on them ... they were perfect for our neighborhood holiday round robin! Tippy Toad has an easy e-mail method to contact them with any questions and they respond during business hours (yes it's a real person and even over e-mail you can sense their pleasant tone). We had a Christmas party and I had decided to order personalized cups at the last minute (thanks Pinterest). After ordering they helped me make sure I had picked the best shipping method. The cups were a huge hit and we plan to make this a staple from now on at our annual Christmas party using Tippy Toad!